Climatesense-norpag: The Epistemology of Climate Forecasting for 8 Year Olds and the Coming Cooling. The Epistemology of Climate Forecasting for 8 Year Olds and the Coming Cooling. "If you cannot explain your finding to an [attentive] eight-year old, you don’t understand it yourself." Miriam - Webster defines Epistemology as " the study or a theory of the nature and grounds of knowledge especially with reference to its limits and validity "
2. Granddaughter - You asked - Is the world going to burn up and how do we know? Ava - Lets think about when the temperature is warmer and colder outside. It is hotter when the sun shines during the day and colder at night when our part of the earth is turned away from the sun .You know already that it takes 24 hours for the earth to turn around once to make what we call a cycle from warm to cold and back again. You also know that it is much hotter in summer than winter and that is because the sun shines longer and is higher in the sky in summer than in winter. Each year there is a cycle from warm to cold and back again which takes 365 days.Scientists have measured or estimated in various ways what the earth's temperature was back for hundreds and thousands of years and can see that there are other hot - cold cycles. Two of the most important ones have cycle lengths of about 60 and 1000 years. Here is a picture showing some of the 1000 year cycles. To know what is going to happen in the future we first have to know where the earth is in the 1000 year temperature cycle. Here is another picture that shows what the temperatures were in the northern part of the earth over the last 2000 years. Look especially at what happened during the last 1000 years. See the warm peak at the year 1000 - then look where we are now at the right hand side of the picture. 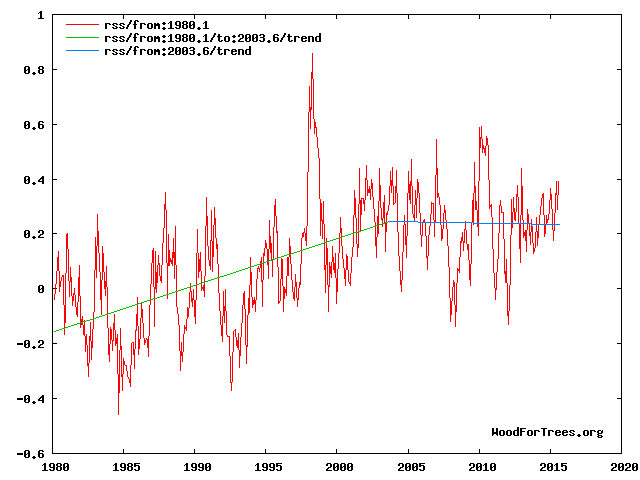 You can see that the earth is just getting near to, is just at or just past the peak warmth of a 1000 year cycle. How can we tell which it is. We know that the amount of sunshine which reaches our bit of the earth often changes the temperature by tens of degrees between night and day and as much as 100 degrees sometimes between cold winter nights and the hottest summer days. We also know that the sun itself puts out more energy and its magnetic field is stronger at the activity peaks of its various cycles. What is the sun doing now? Here is a picture that shows us what has been going on. You can see that sun itself also has cycles of activity of 11-12 years in length. When the red line gets nearer to the bottom of the picture the sun is more active, its magnetic field is stronger and fewer Galactic Cosmic Rays hit the earth. You can see that solar activity was increasing , that is, the red line got closer to the bottom of the picture, in each cycle until about 1991 and that the solar cycle peaks and lows since then are closer to the top of the picture showing a decline in solar activity. 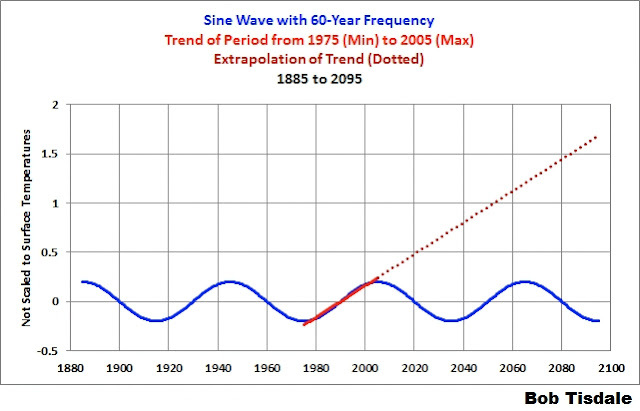 This suggests that the 1000 year peak in solar activity may now be behind us in about 1991. Because it takes some time for the oceans to warm up and cool down, there is a delay before the peak in solar activity shows itself in the earth's temperature. The best measure we have of global temperatures is made by satellites. Here is a picture of how temperatures have changed in the satellite age. You can see how the 1991 peak in solar activity in Fig 3 shows up in the break in the trend of average global temperatures about 12 years later at 2003 in Fig 4. Ava - you ask.- What about the future.? Well the simplest and most likely guess for starters is that the 1000 year cycle from 2003 - 3003 will have a temperature curve whose general shape is similar to the cycle from 1000 - 2003. see Fig 2 . If you look at that Figure again you can see that the Northern Hemisphere average temperature cooled by a bit under 2 degrees from 1000 to about 1635 so that we might expect a similar cooling from 2003 to 2638 - of course with various ups and downs along the way . The warm peak at about 1000 was a good time for people when the Vikings were able to live in Greenland. Harvests were good and people in Europe had time and money to spare to start building cathedrals The cold period around 1635 - to 1700 is called the Maunder Minimum when the Sun was so quiet that the Sun spots disappeared. Most people living before about 1850 grew their own food. Before then, if just a few extra- cold years followed one after the other, millions of people starved to death because their harvests failed. 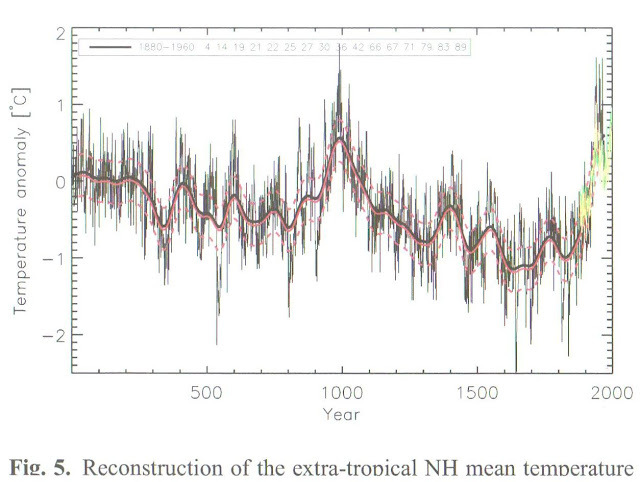 Man made CO2 had no effect on these temperature changes. In fact President Obama is very wrong to call CO2 a pollutant. It is the absolutely essential plant food. Without it life as we know it could not exist. Plants grow better as CO2 increases. About 25% of the increase in food production in the 20th century was due simply to the increase in CO2 in those years - a great benefit to mankind. Ava asks - the blue line is almost flat. - When will we know for sure that we are on the down slope of the thousand year cycle and heading towards another Little Ice Age. Grandpa says- I'm glad to see that you have developed an early interest in Epistemology. Remember ,I mentioned the 60 year cycle, well, the data shows that the temperature peak in 2003 was close to a peak in both that cycle and the 1000 year cycle. If we are now entering the downslope of the 1000 year cycle then the next peak in the 60 year cycle at about 2063 should be lower than the 2003 peak and the next 60 year peak after that at about 2123 should be lower again, so, by that time ,if the peak is lower, we will be pretty sure that we are on our way to the next little ice age. That is a long time to wait, but we will get some useful clues a long time before that.Look again at the red curve in Fig 3 - you can see that from the beginning of 2007 to the end of 2009 solar activity dropped to the lowest it has been for a long time. Remember the 12 year delay between the 1991 solar activity peak and the 2003 temperature trend break. , if there is a similar delay in the response to lower solar activity , earth should see a cold spell from 2019 to 2021 when you will be in Middle School. It should also be noticeably cooler at the coolest part of the 60 year cycle - halfway through the present 60 year cycle at about 2033. We can watch for these things to happen but meanwhile keep in mind that the overall cyclic trends can be disturbed for a time in some years by the El Nino weather patterns in the Pacific and the associated high temperatures that we see in for example 1998 ,2010 and especially from 2015 on. unless I walk to school ? Well Ava - I would have to write a book to explain how so many different people came to be so wrong for so long about so much- sometimes with the best of intentions. Here is a short story telling what happened. In 1968 a man called Ehrlich published a book called the Population Bomb. He thought the number of people on earth was growing so fast that there soon wouldn't be enough food to feed everybody, He said in the book.
" In the 1970s hundreds of millions of people will starve to death in spite of any crash programs embarked upon now. At this late date nothing can prevent a substantial increase in the world death rate"
Some people at the time got very worried and put their guesses about such things as future population growth, food production ,oil supplies, industrial production and mineral reserves into a computer program.. They intended to look at possible future problems and also explore the possibility that the peoples and governments of the earth could agree on a way of running the worlds economy that could be sustainable, that is, go on for a long time. They put all this in a book called The Limits to Growth published in 1972. A very energetic business man called Maurice Strong who knew a lot of very influential people persuaded the United Nations that, as he himself believed and indeed still strongly believes, this sustainability problem was very serious.The UN and Sweden organized a meeting in 1972 in Stockholm to discus the interaction of humans with the environment. Strong was appointed by his UN friend U Thant , to be the General Secretary of the meeting. Strong, by nature, is very determined and action oriented and he and the conference produced an incredibly detailed 109 point action plan designed to give the UN input and even control over individual Government environmental policies world wide. As one of the actions, the United Nations Environmental Program ( UNEP) was organized in 1973 with Mr Strong himself as Executive Director. Ten years later it was obvious that the predictions of imminent death and disaster were wrong. The people at UNEP still wanted to take global control of the worlds economy. They realized that if they could show that the CO2 ( carbon dioxide) produced by burning coal and oil to make electricity and drive our cars might cause a dangerous warming of the earth they would be able to scare the Governments and people into writing laws giving the UN ( and them) control over the world's economy by controlling the type of energy used and its price. "Although the observed global-scale warming experienced over the past ~100 years is compatible with model estimates of the magnitude of the greenhouse effect, unequivocal, statistically convincing detection of the effects of changing CO2 and trace gas levels on climate is not yet possible. 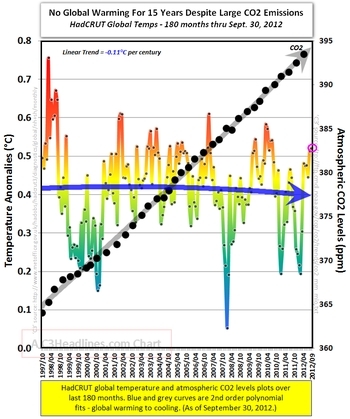 An important problem in the positive identification of a greenhouse gas effect on climate is to explain the medium to long time scale (~decades or more) fluctuations in the past record. Attempts to model such changes have, to date, suffered from a number of deficiencies." Ava - In other words they couldn't prove any effects of man made CO2 on climate. "As a result of the increasing concentrations of greenhouse gases, it is now believed that in the first half of the next century a rise of global mean temperature could occur which is greater than any in man's history. " The report made two important recommendations. As a result of one ,the Intergovernmental Panel on Climate Change was set up to select from the evidence and from time to time produce reports which would show that CO2 was the main driver of dangerous climate change and a second recommendation resulted in a meeting in Rio in 1992 chaired by Maurice Strong himself which produced the United Nations Framework Convention on Climate Change , later signed by 196 governments. The objective of the treaty is to keep greenhouse gas concentrations in the atmosphere at a level that they guessed would prevent dangerous man made interference with the climate system. This treaty is really a comprehensive, politically driven, political action plan called Agenda 21 designed to produce a centrally managed global society which would control every aspect of the life of every one on earth. In other words if the models show there is even a small chance of very bad things happening the Governments who signed the treaty should act now to stop it. But how good are the computer Models? The successive five reports of the IPCC in the Summaries for Policymakers written by Government representatives have clamed increasing certainty for the outcomes of their Model based projections of future temperature which is not supported by the Science sections of the reports or the actual data. "in the first half of the next century a rise of global mean temperature could occur which is greater than any in man's history." All the models and projections made since 1985 were built in the assumption that CO2 was the main climate change driver- for that and for many other reasons they are in reality useless for forecasting future temperatures. As you can see there has been no global warming at all since about 1997. The climate models on which the entire Catastrophic Global Warming delusion rests are built without regard to the natural 60 and more importantly 1000 year cycles so obvious in the temperature record. The modelers approach is simply a scientific disaster and lacks even average commonsense .It is exactly like taking the temperature trend from say Feb – July and projecting it ahead linearly for 20 years or so. They back tune their models for less than 100 years when the relevant time scale is millennial. This is scientific malfeasance on a grand scale. The temperature projections of the IPCC - UK Met office models and all the impact studies which derive from them have no solid foundation in empirical science being derived from inherently useless and specifically structurally flawed models. They provide no basis for the discussion of future climate trends and represent an enormous waste of time and money. As a foundation for Governmental climate and energy policy their forecasts are already seen to be grossly in error and are therefore worse than useless. Here is a picture which shows the sort of thing they did when they projected a cyclic trend in a straight line..
Idols of the Theater are those which are due to sophistry and false learning. These idols are built up in the field of theology, philosophy, and science, and because they are defended by learned groups are accepted without question by the masses. When false philosophies have been cultivated and have attained a wide sphere of dominion in the world of the intellect they are no longer questioned. False superstructures are raised on false foundations, and in the end systems barren of merit parade their grandeur on the stage of the world." Climate science has fallen victim to this fourth type of idol. I am wondering how vegetation will react to less solar radiation, will plants show signs of change before the rest of nature does. I ask because I have had a variegated Ivy plant that sat in a window received a good amount of indirect sunlight. For the past 3 Summers the plant side that faced the window had hints of red in the leaves, otherwise the plant was healthy. In other words in the hottest part of Summer it looked like Fall was approaching. The plant had been in the same spot for 10 yrs, without showing Fall-like leaves. In addition, this year my Nectarine tree blossomed for 4 days, usually it is 2 1/2 to 3 weeks. Simultaneously, I noted that my neighbor's Rhododendron blooming for the same length of time -3 days rather than the normal couple of weeks. Good luck with Leif Svalgaard. To deal with his inevitable objections perhaps you could add references to past solar activity data that is not dependent on the relativel short sunspot history but which points to the 1000 year solar cycle as per Fig 1? I wonder if you also expect the trend of lower peaks in the millennial cycle to continue? Then look at the red line ( Benthic forams) to get an idea of the amplitude and timing if the corresponding temperatures. As to the amplitude of the next millennial peak (about 3003) we will be in a much better position to estimate that when we have better defined the current peak by about 2120. "Ava asks - the blue line is almost flat. - When will we know for sure that we are on the down slope of the thousand year cycle and heading towards another Little Ice Age." Hi Norman, great blog by the way. Are you a real grandfather? I have an 8 year old grandson and while I would not claim he is attentive, I doubt that any real 8 year old would listen to the whole explanation you give. I think maybe a 15 year old. Maybe an 8 year old genius. Derek I have 10 grandchildren ages from 22 years - 4 months. I think if I walked my now 9 year old through the post with an accompanying verbal explanation of the figures she would get the general message. She is one of the brightest of them. Norman, you are a lucky man. My 8 year old is football crazy, but not science sadly. Thanks for commenting on my blog by the way. If you find this site interesting and useful you might like to support the upkeep by donation below.